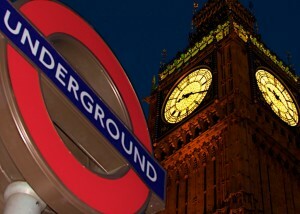 There’s currently two deals on the London Underground to welcome their acceptance of contactless card payments in addition to the Oyster Card. The London Restaurant Festival is back in town for 2014 from 8th October – whilst the offers don’t seem to be quite as good as it was last year (the only place that you can now get a £10 meal is now Prezzo…) it’s got a pretty wide variety of cuisines across Central London. Like last year, you can get a number of the already discounted menus at half price (if you manage to spend exactly £25 in two different restaurants over the course of the festival). If you’re not a fan of set menus, then a number of these restaurants also accept Taste Card/other discount vouchers, but you need to make sure you’re spending around a multiple of £25, and ensure you go to two different restaurants between 8th – 27st October. 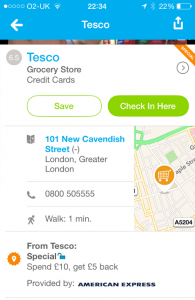 Foursquare Amex deals are back – whilst they’re not as good as they’ve been in the past (especially that infamous £5 off £5 deal back in November 2012 which got me writing this blog), £5 off a £10 spend at Tesco is still a pretty good deal. Argos: Spend £30, get £10 back – remember, a lot of Argos stores stock gift cards – you’ll therefore be able to use this offer on more than what’s in the catalogue! Ask, Pizza Express, Zizzi: Spend £30, get £10 back – you can use this with any other offer, such as vouchers, Taste Card or Orange (EE) Wednesdays at Pizza Express, as long as you charge £30 to your Amex – you could end up getting £60 of pizza for £20 (hopefully not all for yourself!). Alternatively, most of these restaurants sell gift cards, so you can just come back another time. You’ve got until 31st July to claim these. Pick the shop you want to redeem the offer for. 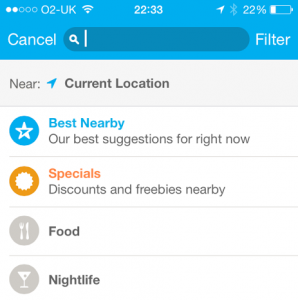 Don’t tap the ‘Special’ link yet! All UK issued Amex cards are valid for this offer, including those from MBNA and Lloyds. You won’t get an instant notification about the credit if you’re not using an Amex issued card though, but it should still show up on your statement. If you’re signing up for multiple foursquare accounts with gmail, try adding a ‘+amex1’ after your username, such as [email protected] Gmail treats the +amex1 as a label, and delivers it all to your inbox! Many of American Express’ cards come with an introductory offer or annual bonus – for example, the Preferred Rewards Gold card gives you 20,000 membership rewards points if you reach the £2,000 spending target in 3 months. The problem comes if you can’t make that limit in a short time – you’ll lose out on the bonus. Here’s where the Amex Gift Cards come in: you buy a gift card now, helping you to reach the target, yet giving you the flexibility to spend your money later. Additionally, until the end of the year, there’s no issue or postage fees when you use the code GCNF1 on the online checkout. Go to the Amex prepaid website, and choose the amount of cards you want – you can buy up to 5, with a maximum value of £100. Enter the code GCNF1 when you’re checking out. You should see the postage charges disappear (the code doesn’t cover gift wrap, so avoid that). 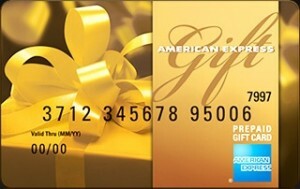 Make sure to pay with your Amex, and you’ll also receive the normal cashback/membership rewards points. From my past experience, this transaction has gone through as a normal purchase, rather than a cash transaction (which wouldn’t give you any cashback/points). Interestingly, it’s the only place I’ve ever seen where you sign up with Amex SafeKey, the equivalent of Verified by Visa or Mastercard SecureCode. How do I use up small balances? You can cash in the card by calling the customer services number for no fee (and they’ll make a transfer of your remaining funds into your bank account), but I’ve found it much easier to just buy an Amazon.co.uk Gift Certificate for the exact amount and send it to yourself – they don’t seem to make a £1 hold on your account (unlike PayPal), and you’re bound to buy something from Amazon within a year! Once your card is empty, you can just throw it away: you can’t reload these cards at all. Which Amex should I get? At the moment, I recommend you get a Preferred Rewards Gold Card: whilst it has an annual fee, you get the first year free. Plus, if you sign up through Top Cashback, you’ll get £10.50 cashback, and if you spend £2,000 in the first three months, you’ll get 20,000 Membership Rewards points, worth £100 in Amazon vouchers (other retailers, frequent flyer and hotel schemes are also available). You’ll also get two airport lounge passes, useful if you’re travelling and want somewhere to relax with complementary drinks and snacks before your flight. That’s a total of £110 worth of free stuff (plus the 2 Lounge Passes)! You should put something in your diary to cancel the account after one year to avoid getting charged the £125 annual fee, and I don’t recommend you use this card after you reach the £2,000 threshold: the cashback is equivalent to 0.5% (if you convert the Membership Rewards points into Amazon vouchers – it might be more if you convert them into airline miles), and there are a few other cards on the market that can beat this cashback. Please note that I earn a £7.50 commission if you are a new Top Cashback user and click through the link above, at no additional cost to you. It’s the offer that got me to start this blog, and it was such a great deal that I thought it would never be repeated again… Shop Small from American Express is back this July! Unfortunately, there’s been a few changes this year: it appears that Amex have learnt their lesson in regards to unlimited cashback. You can only get up to ten transactions reimbursed per card (up to a value of £50), and you only get £5 off when you spend £10, so you’re getting a discount rather than a freebie. Still, 50% off is a pretty good deal in my book! There’s a variety of shops, food stalls and pubs on the list, so I’d highly recommend you take a look, and make sure to register your card before you head out. You need to register online with your card(s) before you shop. 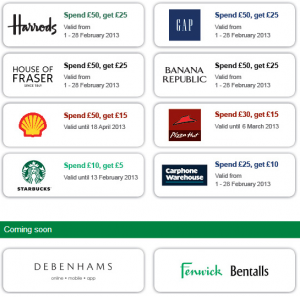 Check out the list of eligible locations by popping in your postcode on the Amex Shop Small site. Spend £10 in store on your registered Amex. You’ll get an email confirming your purchase shortly (this will take longer if you’re using ExpressPay contactless). You can use this offer in conjunction with any other offer, so long as the spend on your Amex is over the £10 threshold – e.g. Taste Card, Vouchers, etc. The discount probably won’t work if you try to use it in different branches of the same shop. To stay safe, use it only in one of the locations. If you have multiple Amex cards (including cards issued by Lloyds TSB and MBNA – mostly frequent flyer rewards cards), each of these are treated separately. Make sure you register each one! If you don’t see the credit in a week or two, or the merchant doesn’t take Amex, get in touch with customer services: call the number on the back of your card, or send an email using secure messaging: they were pretty good in getting the credit added manually last time. Don’t have an American Express card? I recommend you get a Preferred Rewards Gold Card: whilst it has an annual fee, you get the first year free. Plus, if you sign up through Top Cashback, you’ll get £60.60 cashback, and if you spend £2,000 in the first three months, you’ll get 20,000 Membership Rewards points, worth £100 in Amazon vouchers (other retailers, frequent flyer and hotel schemes are also available). You’ll also get two airport lounge passes, useful if you’re travelling and want somewhere to relax with complementary drinks and snacks before your flight. That’s a total of £160.60 worth of free stuff (plus the 2 Lounge Passes), and you haven’t started with Shop Small yet! Please note that I earn a £12.50 commission if you are a new Top Cashback user and click through the link above, at no additional cost to you. 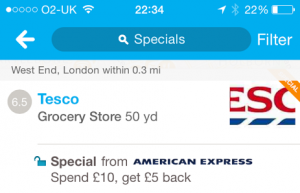 Whilst it might not be as good as the Shop Small promo, there’s a couple of new offers from American Express and foursquare. Most of them start in February, but there’s a few that are good to go now. It’s the same deal as the last foursquare promo: you need to register an account with foursquare, sync your foursquare account with Amex, check in at the location using a mobile app (it doesn’t seem to work on the Windows Phone app), and activate the offer by checking in and selecting the special, and tap “add to card”. Additionally, you can use these in conjunction with any other offer, so long as the spend on your Amex is over the threshold. Here’s the deals that have been on so far. In my opinion, the best method of getting the most value is to get a gift card for the exact amount (e.g. £50), so you can spend your money in chunks, and you have a bit longer to spend your money! Make sure you read my top tips on gift vouchers if you’re going down this route though. * Special tip for Carphone Warehouse: Grab some topup cards for O2, then credit these towards your O2 PAYG sim. You get 5% bonus credit (going up to 10% after 6 months), and you can apply these towards your monthly bill if you transfer your PAYG phone over to contract. If you’re going abroad, you’ll need to have some spending money to spend on those all important essentials. Most cards will charge you a percentage to use them abroad, whilst others charge a flat fee – and some even charge both! These are my top picks of the cards you’ll want in your wallet when you’re travelling overseas. When you use a card overseas, you’ll be paying a Visa/Mastercard interbank exchange rate, rather than the tourist one. For a card with fees, you’ll probably pay a comparable rate to one at a bureau de change, but if you use one of the cards recommended in this article, you’ll get an unbeatable exchange rate. It’s also important to note that you should never accept “Direct Currency Conversion” – this is when the foreign retailer or cash machine offers to charge you in pounds – this always has a fee, which is easily beaten by your card. This is my favourite card for foreign spending – and one that I use on a day-to-day basis for merchants that don’t accept American Express. 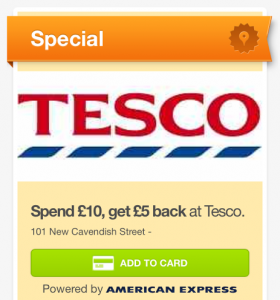 With this card, you get both no fees for foreign purchases, as well as £5 cashback when you spend £300 a month. Note that you will need a Halifax Rewards Current account to apply for this – but this is a great deal too. Simply pay in £1,000 a month, and you’ll get £5. You don’t even need to keep the money in the account. You’ll need to go into branch to open this credit card, but if you just want the 0% foreign spending with no cashback, you can apply online. You should never be taking money out on your credit card, even if there is no cash withdrawal fee – you’ll be charged interest from the day you take out the cash, even if you pay off your statement balance on time – there’s no float period on cash. The Metro Bank Debit Card is the best card to use in Europe – it won’t charge you fees for making the cash withdrawal. Just make sure to top up your account before leaving the country. You’ll need to get to one of their branches in London to get this account, but they’ll make it up for you on the spot in the branch – useful if you’re travelling abroad soon. Alternatively, try the Norwich & Peterborough Gold (Classic) Current Account (although, please note the funding and activity requirements) – this also offers free card usage abroad, and you can apply online. I haven’t tried this account though. You should probably carry a bit of cash with you before you go: if you’re using Euros, there’s a euro denominated cash machine at the NatWest headquarters in Bishopsgate, which you can use your Metro bank debit card with. Otherwise, try TravelMoneyMax to see the best exchange rates – it’s often at the Thomas Exchange Global stand in the Liverpool Street arcade. It pays to plan ahead – you’ll get the worst rate at the airport, and you’ll get a slightly better rate at many of the bureau de changes if you book online first. I don’t recommend Prepaid cards – they don’t really have any advantages over a 0% debit/credit card, and there’s often a bunch of additional fees as well. Travellers Cheques have an advantage over cash, since they can be replaced if lost, but it’s often difficult to cash them in at your destination. Additionally, there’s a worse exchange rate than cash at the bureau de change, because the fees have to be built in. There’s the old adage that “cash is king”, but when it comes to paying for things, as a consumer, it’s much better to pay by credit cards. You’ve got to ensure you’re using them wisely by spending within your means, and make sure you set up a direct debit to pay off the full statement balance each month (and you ensure you’ve got the money in your bank account to pay off your direct debit!). There’s a bunch of different reward offers around which give you a credit for simply using the card for your day-to-day transactions: if you’re a member of a frequent flyer/hotel loyalty program, it can be useful to boost your miles or points. Alternatively, you can earn cashback, usually around 1-1.25%, depending on the card. Watch out for annual fees though, as these will eat into your cashback if you don’t spend enough to make it worthwhile. With a credit card, you have protection in law under Section 75 of the Consumer Credit Act, which makes the credit card company jointly liable with the retailer for transactions over £100 if the company you buy from doesn’t deliver. In practice, this is done through a chargeback through your credit card provider – they will investigate your claim, and then retrieve the money from the merchant’s bank, who will then debit their account, along with a handling fee. If you’re using a debit card, you should be able to do a chargeback, but this isn’t enshrined in law. On the other hand, if you’ve paid by cash or cheque, you’ll have to take it up with the merchant and hope you get your money back. Your online statement is a great way to work our where you spent your money – it’s unlikely that you’re keeping a record of where you are spending all those cash withdrawals, right? Paying off your credit card on time helps to build your credit rating – this shows lenders that you’re a good credit risk, and should help you get credit in the future. You get up to around two months interest free credit. This is the period in between spending on the card, receiving the bill, and the money coming out through the direct debit. You can earn interest on this money if you’re using a top current account, like the Santander 123 Current Account. There are currently a number of cards that allow you to do this – both credit and debit, such as the Halifax Clarity Credit Card, or a Metro Bank Debit Card. The benefit of using these cards abroad is that you’ll benefit from the interbank exchange rate, rather than the tourist one which is always a couple of points in their favour. Just watch out for dynamic currency conversion – this is when the machine will ask if you want to pay in Pounds rather than the foreign currency: you should always reject this offer. It’s a lot easier to pay by contactless than it is to by cash – you don’t need to fumble with change. In London, it’s accepted at a load of retailers – mainly chains, but they’re starting to roll it out. Plus it’s now cheaper to use your contactless card on the bus than paying by cash if you forget your Oyster. If you’ve looked at my blog recently, you’ll have seen the multitude of offers that have been available for American Express card holders – whilst this isn’t a guarantee that they’ll come back again, there’s usually an offer or two about. In the unlikely event that you do get defrauded, it’s the credit card company’s funds – if you were using a debit card, there’s the possibility that you could be without cash. So, ditch your cash and debit card, and use your credit card for all your purchases.